CARBONDALE — Shafiqua Maloney lives for the 400-meter run. From the first one to the last one. The sophomore from St. Kitts and Nevis, an island country in the West Indies, won her first Missouri Valley Conference outdoor championship in the 400 earlier this month. 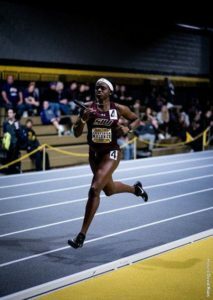 Her personal-best time of 53.19 seconds broke the Gibson Track and Field Complex record in Terre Haute, Indiana, and gave her an indoor/outdoor sweep of the event. Maloney is in the fourth heat of the 400 dash today at the NCAA West Preliminary Round in Sacramento. The top-three times from each heat, and the next six-best times, qualify for the quarterfinals. If she doesn’t make it in the 400, she’ll have the 200 and two of SIU’s best relays, the 400 and 1,600, which is Maloney’s next-favourite event. When the last event of the meet rolls around, the Salukis rise to the occasion. SIU won its ninth 1,600-relay conference title earlier this month at Indiana State with another facility record (3 minutes, 38.10 seconds). Maloney ran a 53.3-second split on the anchor leg to help the Salukis capture the indoor/outdoor sweep in the event. Maloney came to SIU on the recommendation of Warren Hazel, a sprinter like her from St. Kitts who is in California to compete in the men’s 400. A high school coach, who saw her figure walking up the stairs one day, told her she had the potential to be a star. She believed him, and started training. When her mother, a former runner who worked for a cruise ship line, was gone for eight to nine months, Maloney trained to keep her sanity. She teamed with Genesis Ewell, Tyjuana Eason and Bri’Anna Branch to win the 400 relay at the MVC championships. The quartet ran the fourth-fastest time in school history (44.59 seconds) for one of nine conference titles at the outdoor championships. SIU has 15 athletes in California to try to take their next step toward an NCAA championship today. Evans and Branch are in the 100 prelims, and A’veun Moore-Jones and Sian Person are in the women’s shot put. On the men’s side, Luke Horton is in the 800 prelims, and Nate Dyer is in the men’s hammer throw. This weekend will be a homecoming of sorts for SIU director of track and field/cross country Kathleen Raske. The SIU Hall of Famer was the director of Sacramento State’s track and cross country programs for 12 years before coming to Carbondale in 2015. She won Big Sky Conference coach of the year 16 times, produced 15 NCAA All-Americans, 191 conference champs and eight USA track and field junior All-Americans. The Hornets’ men’s and women’s teams combined to win 17 Big Sky team championships under Raske and finished second eight times.